As Japan’s most popular showbiz personality, Takuya Kimura, 45, more commonly known as Kimutaku, has been in the public eye since 1988, when he was chosen to be one of six boys to form the new boy band SMAP, which became a Japanese phenomenon beloved by all ages. After a record 28 years together, SMAP eventually disbanded in 2016, but their popularity as individuals was already cemented with the public, as Kimutaku and his fellow band members had starred in TV dramas, movies, and countless ads over the years, which were all immensely successful. Above everyone else, though, Kimutaku’s appeal was always off the charts, as everything he starred in became a massive hit, and his Midas touch appears to extend to his progeny as well, with his 15-year-old daughter now making headlines in Japan following her modeling debut. 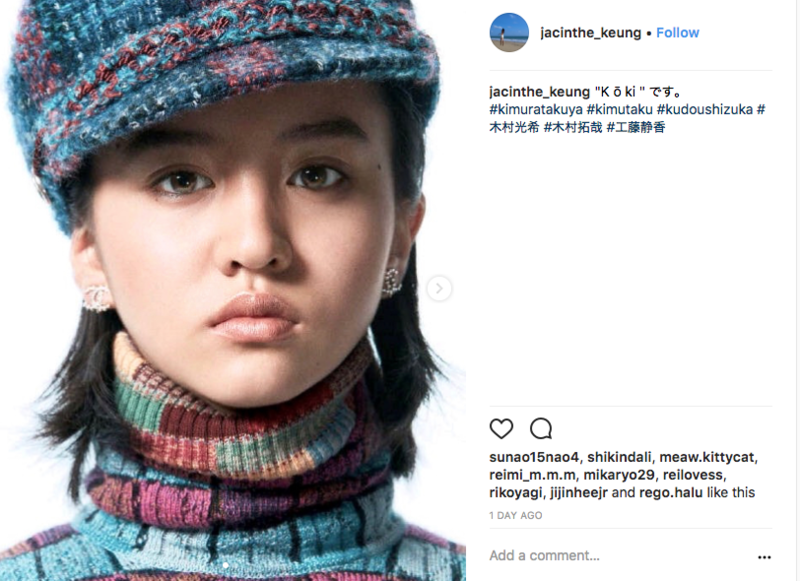 Koki set up an official Instagram account four days ago, with a mysterious post hinting at big things to come before her official debut announcement. Teaser clips followed, to generate a buzz around Elle’s new superstar model. 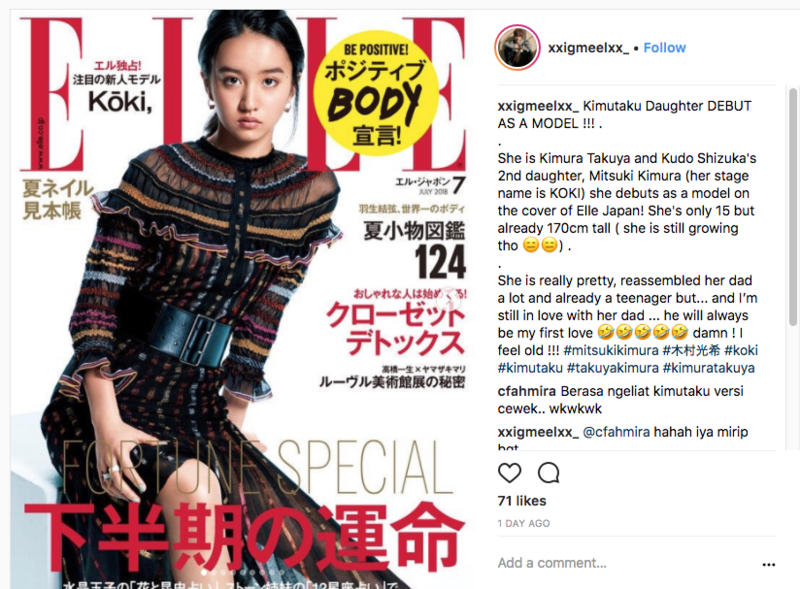 Then, on Monday, Elle Japan released a video, showing that a star truly is born, with Koki bearing a striking resemblance to her famous father in a number of scenes filmed during the photo shoot for Elle’s new July issue. According to Elle, their new cover girl encapsulates both purity and strength of spirit, and is also a gifted musician who can speak Japanese, French and English. The 170-centimeter-tall model is definitely more than just a pretty face, and with Japan swept up in the news that we now have another member of the Kimura family to fall in love with, this is just the start of what is sure to be an insanely successful career. What a beautiful ordinary girl. I think with daddy behind her, she will develop a huge bank account. @Haruka, yup thats it, the meaning of life - a huge bank account. Who you know still counts for a lot in every walk of professional life. She looks just like her dad in that second picture. I already feel sorry for her. She will not only have to deal with some of the usual modelling world stuff (maybe not the managers and agencies etc. as they would not dare try to exploit her, but the sniping and jealous from many in the business), but also the extra burden of having exceptionally famous parents. Grew up in one bubble and now enters another one. Another exotic animal to gawk at for most people. But, maybe she is used to it. Pretty for sure. Beautiful? Each to their own, but far from ordinary. Daddy is a celeb and part of Johnny's. Do you think she would be modeling if it wasn't for the old man and co.
Daddy is a celeb and part of Johnny's. Do you think she would be modeling if it wasn't for the old man and co. thats the problem with the world too many are famous and rich because they're related to other famous or rich relatives. The people that i most admire are those that become famous because of something they achieved on their own or a rag to riches story of someone with nothing and built something from scratch by sheer determination and foresight. Guess what, I actually agree with you, but sadly, the reality is, if you are famous and have kids, they will be famous just because their parents were famous, saves them a lot of time to make it in the world. But there are kid celebs that have made names for themselves. I have a friend in Japan (won’t mention the name) is a famous singer, huge and this singer won all kind of awards, now this singer has a younger sibling and that sister (to be brutally honest) doesn’t have any real talent, but she always liked to take pictures, but other than that, not that good at most things, she one day met a famous photographer from Tokyo, when he found out who this persons sibling was, he decided to take this person under his wing, taught this sibling about the the photo business and now that person in Japan a famous photographer. So while you are right, kids and siblings of famous celebs will, as I said before, have a huge advantage over people that have to work hard to get to a certain point in life. Too young ! They should know better. This is child work.